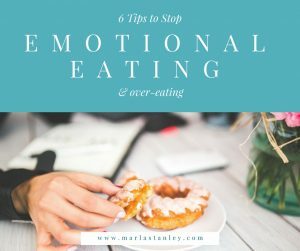 Emotional eating…the requested topic I was pondering for our Success Call (a weekly dose of tips, encouragement and truth to help you develop true health hosted LIVE Tuesdays at 9pm on Facebook here)…As I stuffed a handful of goldfish in my mouth that afternoon, I knew we had to cover this topic. It’s real, right?? eating in response to emotions instead of hunger. Emotional eating is a way to soothe or suppress a [negative] emotion such as worry, fear, boredom, loneliness, anger, sadness, or stress. While this is the accepted definition, I would actually say that emotional eating is eating in response to any emotion. There is an underlying link between the emotion and food that we have to recognize is there even with over-eating during a positive emotional occasion. KEY: How are we using eating or food in this situation–using food to attempt to control, cope, or monitor feelings or thoughts. Anything depending upon the person! <–yes, truly it can be anything that has shaped you individually into a habit of turning to food. We have to learn how to deal with these negative emotions instead of just turning to food. THE RUB-God made us emotional creatures! This isn’t a flaw. He himself is an emotional God. However, that doesn’t mean that He is ruled by His emotions, and neither should we be. THE REALITY: God made our bodies, and as believers they are not our own. 1 Corinthians 3:16-17, “Do you not know that you are God’s temple and that God’s Spirit dwells in you? -Wear a rubber band and snap it to physically get your own attention. WORRY- 1 Peter 5:7, Cast all your anxiety on him because He cares for you. FEAR- Psalm 34:4, I sought the LORD, and he answered me; he delivered me from all my fears. BOREDOM- Proverbs 19:15, Slothfulness casts into a deep sleep, and an idle person will suffer hunger. STRESS- Matthew 11:28-30, Come to me, all you who are weary and burdened, and I will give you rest. 5. PRAY before eating and give thanks for what God has created good for your body. 6. FIND other ways to feel good, not just by eating. -What makes you feel good? Examples: Connecting with family/friends, Working out-endorphins!, Have a dance party! Ready to radically transform your health from the inside out? You need to participate in my next Clean Week Challenge Group! Sign up or join the Waitlist by going here.